This entry was posted on May 27, 2015 by Marco Rivera. 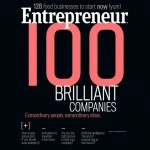 Each year Entrepreneur Magazine picks their 100 Brilliant Companies to Watch. These ideas, companies, applications and inventions have amazed us with their unique solutions to common problems or marketplace voids, executed in forms both ultra-high-tech and strikingly simple. Entrepreneur divides these innovators into the 10 categories, and this year Patch of Land is proud to have found itself as one of the Brilliant From the Crowd companies to watch in 2015. "The Patch of Land lending marketplace matches accredited and institutional investors with borrowers who are looking for funding for real-estate projects but are routinely bypassed by traditional lenders." Patch of Land's selection as one of Entrepreneur's 100 Brilliant Companies to watch is an honor and we are happy to share this news with everyone who has helped contribute to our success. Our goal is to continue providing you with cutting-edge technology, revolutionary innovation, and the superb customer service you've grown accustomed to seeing from us. Thank you again for all your support and inspiration! This entry was posted in News & Press and tagged Peer-to-Peer funding, From the Crowd, Entrepreneur Magazine, Entrepreneur's 100 Brilliant Companies, Peer-to-Peer Lending, real estate crowdfunding on May 27, 2015 by Marco Rivera. Hello, I am an investor relocating to California soon and I am interested in getting some information about your hard money loans. Please email me with information or call at 210-259-5507. Thank you. Could I have more information about loans. Is the rehab combined with the purchase loan? What are the appraisal fees, origination fees and closing costs? Is it possible to wrap fees into the loan? How is money disbursed? And do you provide proof of funds or pre-approval letters?